Investigators have said five teenage girls who lost their lives while playing an “escape room” game in Poland died of carbon monoxide asphyxiation, prosecutors said, using a technical term for smoke inhalation. A faulty heating system appeared to have caused a fire at a house in the northern Polish city of Koszalin. 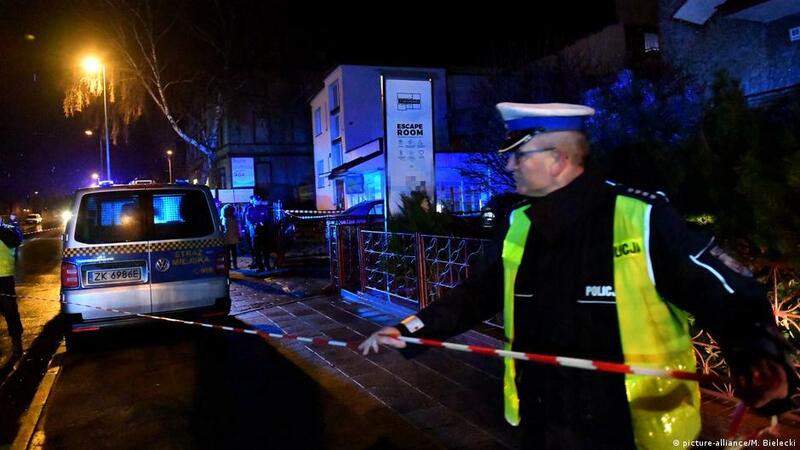 “The victims of this tragedy are 15-year-old children, girls celebrating a birthday,” Interior Minister Joachim Brudzinski told broadcaster TVN24. A 25-year-old man, reported to be an employee of the game center, was also injured in the incident. “One man with severe burns was taken to an intensive care unit,” fire department spokesman Tomasz Kubiak told AFP news agency. Earlier Saturday, Poland’s top firefighter, Leszek Suski, also said that electrical wiring at the location was not to standard and was also placed too close to flammable materials. Suski also said that the facility had no proper evacuation route, adding that a “a lot of negligence” was noted at the location, according to comments carried by the AP news agency. In an escape room game, the players are locked inside a room or building and must find clues that help them to leave it. “There should be a moderator able to unlock the rooms and let people out,” he said. Escape room games are widely popular in Poland, with over 1,000 locations across the country. Following the Friday fire, local residents placed flowers and lights at the Koszalin site.